Jiang Ziya (11th century B.C., dates unknown) - Jiang Ziya was not the first emperor of the Zhou Dynasty, but it would not have existed without him. Originally a member of Di Xin's court, he became disgusted by the Shang emperor's debauched lifestyle and feigned insanity in order to escape it. Legend has it that he disappeared and spent his days fishing, waiting for an opportunity to serve in the overthrow of Xin. That opportunity came in the form King Wen of Zhou. As the legend goes, Wen was told by his grandfather that he would one day find a grand sage who would assist in the rise of the Zhou Kingdom. Their meeting was mutually beneficial as Wen realized that Ziya must be the sage his grandfather had foretold would assist him and Ziya saw in Wen the person who could challenge Xin. Wen soon discovered that Ziya was a brilliant military strategist and assigned him the task of building and training the Zhou army. 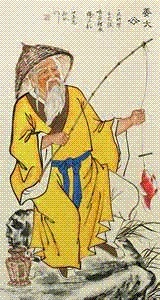 After Wen died, his son, Wu, continued to depend upon Ziya as the Zhou prepared to attack the Shang. At the Battle of Muye, it was Ziya who led the Zhou army to victory. The new emperor, We, rewarded Ziya by putting him in charge of the State of Qi as China was re-organized under the new dynasty. How much of the life of Ziya is legend and how much is historical fact is unknown, but what is known is his expertise on combat. Centuries before the most famous military treatise in history, Sun-tzu's Art of War, Jiya authored his own brilliant work on military strategy, the Six Secret Teachings. This book also records the famous meeting between King Wen and Jiang Ziya.